Since its founding, MIT has fostered a problem-solving approach that encourages researchers to work together across departments, fields, and institutional boundaries. The resulting collaborations have included thousands of fruitful partnerships with industry and other leading research institutions. Currently over 700 companies are working with faculty and students on projects of mutual interest. Among these corporate sponsors are such global leaders as BAE, BP, Boeing, Du Pont, eni, Ford Motor, Google, Intel, Lockheed Martin, Novartis, Quanta Computer, Raytheon, Samsung, Sanofi, Shell, Siemens, TOTAL, etc. MIT has vibrant patenting/licensing activity, with 794 new invention disclosures in FY17, and $47 million in total licensing revenue. According to the report, Entrepreneurship and Innovation at MIT, MIT alumni have launched 30,200 active companies, employing roughly 4.6 million people, and generating roughly $1.9 trillion in annual revenues. According to the National Science Foundation, MIT consistently ranks first in industry-financed R&D expenditures among all universities and colleges without a medical school. Industry-sponsored research totaled $148 million in FY17 (includes government pass-throughs), or 21% of all MIT research funding. 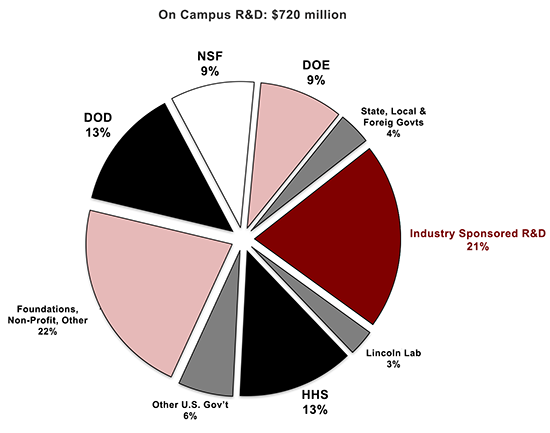 In FY17, over 700 companies provided R&D/gift support to MIT; 40 companies funded $1million+, 235 companies funded $100 thousand - $1 million. MIT welcomes all industry partners who seek practicable and pragmatic solutions, and who share and celebrate the entrepreneurial spirit that brings new ideas to life. Together, MIT and industry can make great progress in creating new knowledge, in shaping new leaders and in making important gains against the challenges of our generation.